Recently, online listings from upcoming Zombie Strike Sidestrike & Crossfire Bow have been put up. Once again, it seems like Nerf is releasing new products in time for the holidays, and these blasters are their release choices. You can do a store check on these sites in order to see what stores have them. Many in my location don’t have them yet though. The Magnus blaster has also been spotted in some areas on the East Coast in the USA as well. Check the rest of the post for Target product shots and product descriptions of the Sidestrike and Crossfire. Prepare for the zombie apocalypse with a Nerf Zombie Strike Crossfire Bow Toy. 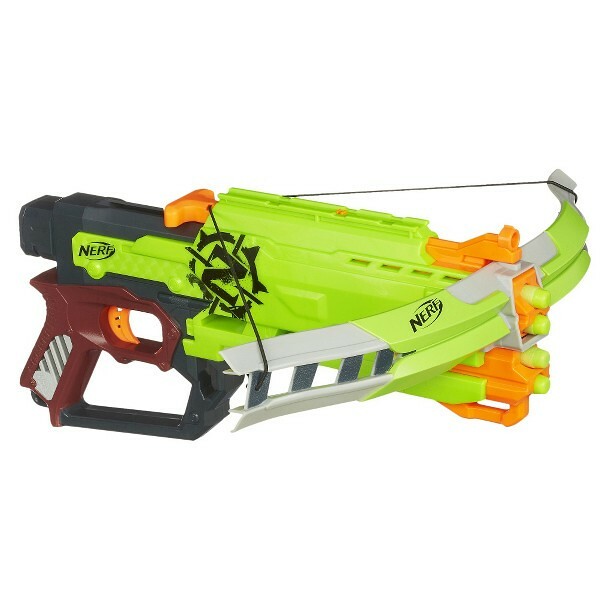 This Nerf crossfire bow has fun pull-back firing action that gives keep the feel of firing a real bow. It shoots darts up to 75 feet. 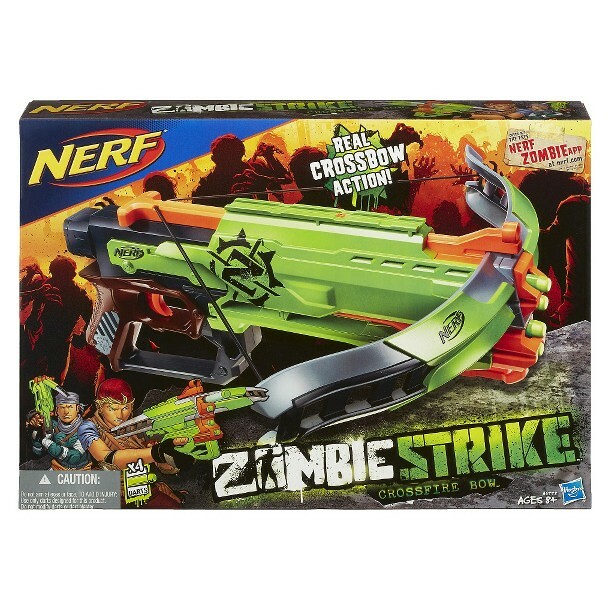 A great gift for kids, this Nerf bow comes with 4 Zombie Strike darts. Ages 8 and up. 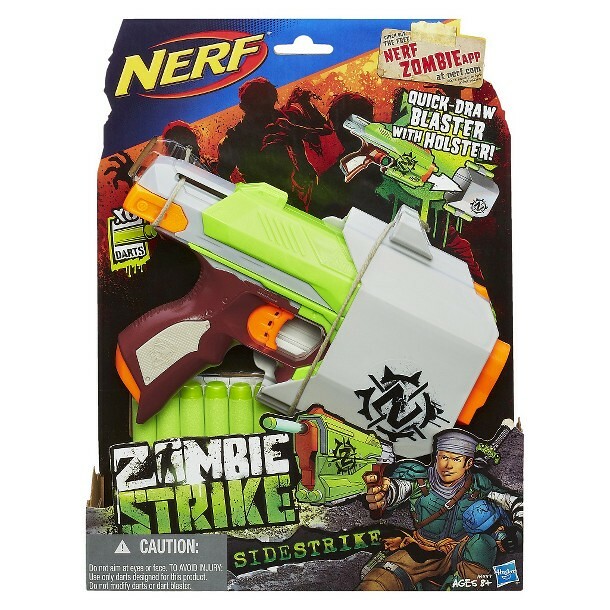 Make quick work of zombies with a Nerf Zombie Strike Sidestrike Blaster. 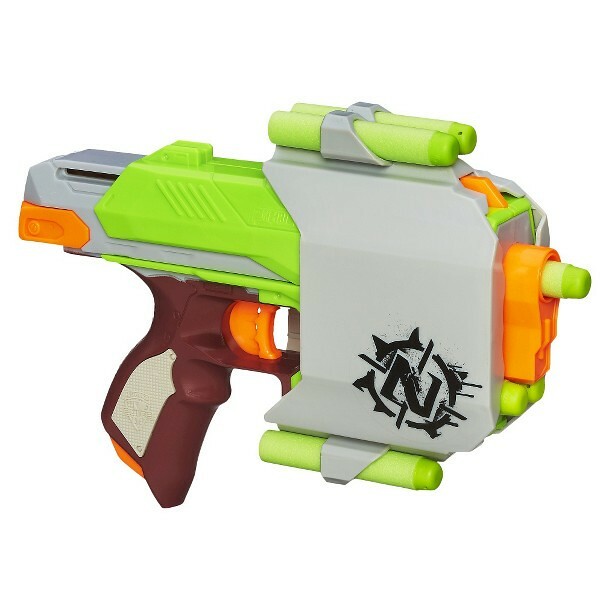 This Nerf blaster works as a quick-draw blaster and shoots Zombie Strike darts up to 75 feet. The Sidestrike has a tactical rail on the bottom and can store 2 darts under the muzzle. This cool new Nerf gun comes with a blaster holster, 6 foam darts and instructions. Ages 8 and up. Well, we were just waiting for this to happen. In the future I may pick up a Sidestrike, but definitely not a Crossfire Bow. 1) To some, the blaster’s ugly. It is, slightly, to me. But I will still make use of it. A common gripe is that the last half of the slide area is exposed, revealing the groove. 2) The holster. Nerf said it would fit a Firestrike. And that means it could fit a slimmed down NF as well. 1) No point. If you were fighting zombies, would you pick up a bow or an SMG? Even with the arms detached, it’s a glorified pistol. Sure it may have a stock attachment nub, but deep down it’s still a muzzle-loading single-shot. 2) $20 also gets you a Stryfe, which is all kinds of awesome. I recommend (even with the updated one) removing the dart sensor lock. Speaking of the Magnus, I just happen to live on the East Coast. I so want a Magnus, as it looks so cool and actually works. Simply put, the Centurion’s just broken. It’s majorly screwed up. See http://bazookafied.blogspot.com/2013/08/mega-centurion-review.html for more. It is extremely broken though it looks awesome. There is a kit you can buy from BlasterParts (they are in Germany if I recall) that allows your Centurion to fire normal elite darts. I don’t generally mod my internals because I use my blasters for a LARP, but I will be buying this 2 part kit to make the Centurion worth owning. On a side note, the Magnus is freaking great. The CF is actually a four-shot, same principle as a Rough Cut. Actually works quite nicely for me. Also, the SS holster is ambidextrous, meaning you can wear a pair of them nicely! I can take or leave the holster but this is one of the most accurate NERF single shot blasters I have ever had. It fits the hand well and is a decent back up blaster.